Baby boomers are fast becoming the largest-ever generation of retirees: 75 million strong. As they move to and through retirement, how and where they choose to live will have a profound impact on our homes, families, and communities. 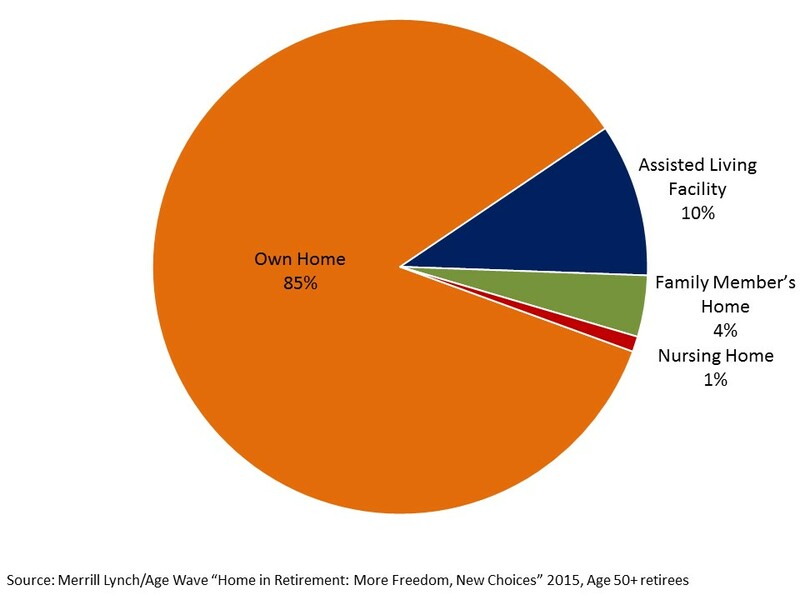 In order to deeply understand these huge shifts, Age Wave, in partnership with Merrill Lynch, just completed a comprehensive study titled Home in Retirement: More Freedom, New Choices. We surveyed a representative sample of over 3,600 adults from all walks of life to uncover their priorities, dreams, challenges, and worries as they determine which geographic regions, communities, and homes they will live in during their retirement years. This is the second of two articles that describe our findings. As I mentioned in part 1 of this series, there are now two distinct phases of retirement. The first phase, which I focused on yesterday, can often span at least 15 or 20 years and has become a time of more freedom and new choices for how and where people choose to live. 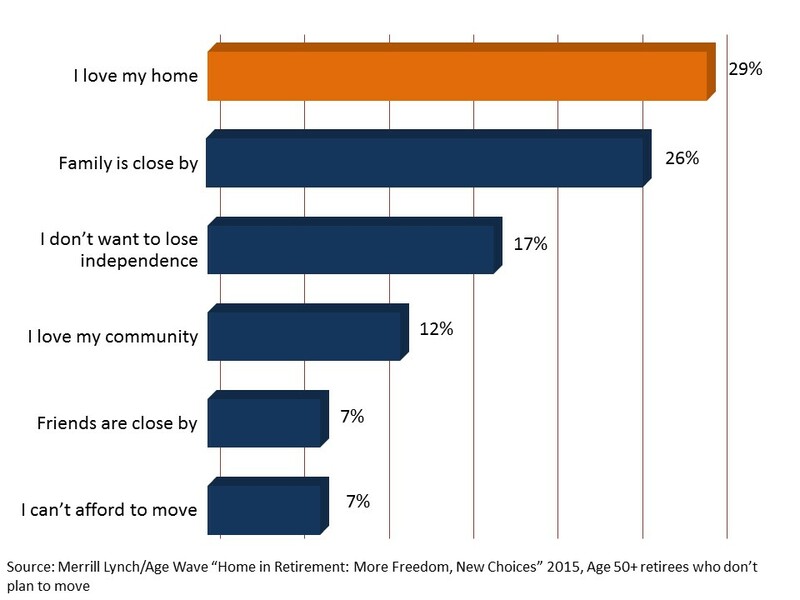 Our study found that the freedom to live where and how you like seems to peak in this first phase of retirement, with two out of three retirees saying they are living in the "best homes of their lives." In the second phase, as retirees get older, especially as they reach their 80s, health and the ability (or inability) to live independently can become significant factors in home-related decisions. Among people age 85+ -- the fastest-growing segment of the U.S. population -- three-quarters (74 percent) have difficulties with at least some daily activities, such as housework, getting around the home, or other everyday tasks. These realities often are the trigger points for either making home modifications to improve the accessibility or security of a home, getting help from a home care provider, or choosing to move to an environment where care is available around the clock. As you can see, the portrait of housing choices in later retirement is expanding to include a growing variety of supportive housing/community options. As one focus group participant told us, "It's a relief to know that if either my spouse or I encounter a health challenge down the road, it doesn't mean we end up in a nursing home. There are many appealing alternatives that we're beginning to explore while we're still healthy, so we won't be caught off guard in a crisis." Although the menu of choices for how and where to live in later retirement has grown and will continue to do so, retirees told us their number-one choice for receiving extended care, if needed, is to age in place: To receive care in their own home (see below chart). With a growing number of qualified home care services and new technologies such as telemedicine, remote diagnostics, security monitoring, and emergency response devices, it is increasingly possible for retirees with health challenges to do just that: remain in their own home and receive top-quality care. We're already seeing a significant shift in that direction. As boomers enter their later retirement years and the potential need for long-term care increases for many, new services, technologies, and options will continue to develop, empowering even more retirees to receive care how and where they most desire. When we asked all retirees who hope to remain in their own home and never move, the number one reason they state is, "I love my home." See below chart. Our study also revealed that today's retirees are increasingly willing to embrace new technologies that will give them the freedom to age in place. They are optimistic that these technologies can make their homes more convenient, connected, and secure, and give them the wherewithal to remain in the homes they love so much. As the boomers migrate through their retirement years, chances are that even more technological innovations (like driverless cars) will allow retirees to live independently at home for as long as they choose. First, even though you may feel vital and healthy right now, begin to think about what you might want to do if the possibility of long-term care were ever needed. Put a potential plan in place now. Do this by researching options that would allow you to receive care where you most prefer, whether you choose to move to some form of supportive community housing or remain living independently in your own home. As David Tyrie, head of Retirement and Personal Wealth Solutions for Bank of America Merrill Lynch, points out, "With increasing longevity, it's important to remember that achieving your dream home and ideal living circumstances in retirement requires careful forethought and preparation, including consideration of expenses related to current goals and future priorities." Second, if like so many retirees today, you choose to live independently (with your spouse/partner or alone) in your own home and receive any assistance or health care needed in that home, consider home modifications, technologies, and services that can empower you to remain in that home. Some of the most helpful modifications include replacing door handles and faucets with easier-to-manipulate levers; making sure that all electric switches and plugs are easy to access; removing slippery throw rugs and wiring that could be tripped over; installing bathroom safety features such as railings and nonskid strips in bathtubs and showers; and, if necessary, installing ramps or even stair lifts to make it easier to navigate if there is more than one level in your home. The burgeoning field of home care services and health monitoring and alert technologies can also enable you to continue living independently as long as possible and offer solutions that will allow many boomers the opportunity to age in place. The aging and retirement of the boomer generation, coupled with the fact that we're all living longer than previous generations, is reshaping America. The research in this study provides a glimpse of what some of those changes will be. There are more useful ideas, tips, and information you can explore in the complete Home in Retirement: More Freedom, New Choices study report, which you can download here. I look forward to hearing any comments or questions you may have about your own retirement housing dreams and concerns. "Accessibility principles make kitchens that anyone can enjoy," Pierce told Huff/Post50. "A side-swing oven door allows the cook to reach inside more easily, while leaving space below a sink and countertops allows the user to sit while working in the kitchen."